Nicky Byrne was born in Dublin, Ireland. He is best known for his time spent as a member of the hugely successful Irish boyband, Westlife. Music was a big part of Nicky’s upbringing. His father Nikki Snr, was also in a band, and this is where Nicky’s love of music originated. However Nicky’s exceptional talents on the football field, saw him establish himself as a professional goalkeeper at a very young age. He played for the Republic of Ireland under 15/16 and at 18 was signed to Leeds United. During the 1995 Premier League Season, following a suspension to second choice goalkeeper Mark Beeney, Nicky was named in the Leeds United first team squad to face Southampton in a Premier League game at The Old Dell Stadium. On his return to Ireland in 1997, he played for Shelbourne F.C., Cobh Ramblers and St. Francis F.C. His love of music then led him to a career in the music industry. He joined Westlife in 1998, after successfully auditioning for Louis Walsh. The band retired in 2012 after 15 hugely successful years as one of the biggest boybands in the world. Westlife have sold over 50 million records worldwide, have had 14 number ones singles, and 7 number one albums. In the latter years of his time with Westlife, Nicky realised his passion for TV and Radio. He has an excellent array of hosting and presenting experience. He has hosted the Cheerios ChildLine Concert an impressive 7 times, in front of a packed crowd at Dublin’s O2 arena. Nicky also hosted the closing ceremony of the Special Olympics in 2003, to a crowd of 80,000 live from Dublin’s Croke Park Stadium. He has also presented various well known TV programmes such as RTÉ’s Football’s Next Star in 2012, as well as several radio programmes including most recently standing in for Ryan Tubridy on RTÉ’s 2fm. Nicky also recently took part in BBC’s Strictly Come Dancing and successfully made it to the ninth week of the show. Of his experience on the show, Nicky said, “It has been just so much fun. It is the biggest and best show in the world. To come out every Saturday night is hard but it’s playing a different character, doing a different dance – it’s just been amazing! In March 2013, Nicky was given the honoured role of Grand Marshal in the Dublin City St. Patrick’s Festival. Nicky was chosen by Festival organisers for his outstanding contribution to the entertainment industry. Nicky also appeared on screens in July 2013 on RTÉ’s new songwriting talent show, The Hit. 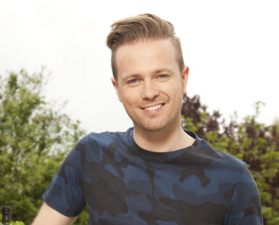 Nicky is also set to join RTÉ 2fm with a brand new show, airing mid morning, weekdays from 11am.